One of the ideas brought out in the book is that of self-centeredness. Would you agree with me that we live in a world full of people consumed with self? 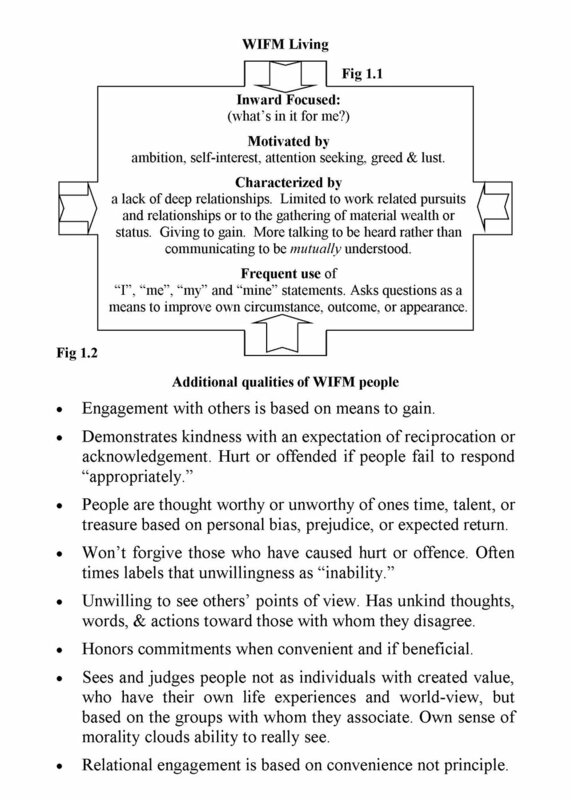 In today's post I am asking if you are a WIFM person or relational person. WIFM? Is that a new radio station? It's not, but if it was I wouldn't recommend tuning in. Perhaps you'd prefer to find a station that focuses a bit more on the needs of others. We live in a WIFM world where people are more concerned with "what's in it for me" than they are with "how can I best serve you." Imagine what it would be like if we all tuned out of the one and into the other. Take a look at the figures below and determine if you are living a WIFM life or a Relationally Driven one and then let's talk. Based on the above information, did you line up where you thought you would or did you see room for improvement? If you're like me it was probably a little eye opening, which is great because we won't fix a problem if we don't recognize that there is a problem. If the book isn't your thing but you'd still like some help making changes in your personal life or on your job you can just click on the "Service & Contact Info" tab at the top of this page for details. Thanks so much for stopping by and checking out the post. I'd love to hear your thoughts. ABOUT THE AUTHOR- Dwayne Castle is the owner of Relationally Driven- a performance coaching venture which exists to help businesses and individuals improve the soft-skills necessary to grow their spheres of influence, improve employee retention, increase their bottom lines, and realize their dreams.